Journal of Applied Gerontology provides an international forum for information that has clear and immediate applicability to the health, care, and quality of life of older persons. Each issue brings you the latest research and analysis from the field—and helps you apply it to your everyday practice. ... is the official journal of the Southern Gerontological Society. The Journal of Applied Gerontology features articles that focus on research applications intended to improve the health and quality of life of older persons or to enhance our understanding of age-related issues that will eventually lead to such outcomes. We construe application to include original investigations or meta-analyses/systematic reviews that have significant clinical, policy, and/or practice implications. Rigorous studies of theoretical, conceptual, or methodological issues pertaining to research application are also welcome. policy evaluations that apply evaluation principles and methods to examine the implementation and effectiveness of a government or institutional policy or program. Because the circulation and intended audience of the Journal of Applied Gerontology is global and diverse, contributions from international scholars and across disciplines are encouraged. The Journal of Applied Gerontology recommends that authors follow the Recommendations for the Conduct, Reporting, Editing, and Publication of Scholarly Work in Medical Journals formulated by the International Committee of Medical Journal Editors (ICMJE). Please read the guidelines below then visit the Journal’s submission site http://mc.manuscriptcentral.com/jag to upload your manuscript. Please note that manuscripts not conforming to these guidelines may be returned. Manuscripts should be submitted electronically. 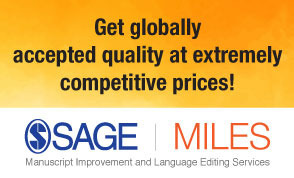 Authors will be required to set up an online account on the SAGE Track system powered by ScholarOne. Only manuscripts of sufficient quality that meet the aims and scope of the Journal of Applied Gerontology will be reviewed. As part of the submission process you will be required to warrant that you are submitting your original work, that you have the rights in the work, and that you have obtained and can supply all necessary permissions for the reproduction of any copyright works not owned by you, that you are submitting the work for first publication in the Journal and that it is not being considered for publication elsewhere and has not already been published elsewhere. Please see our guidelines on prior publication and note that JAG may accept submissions of papers that have been posted on pre-print servers; please alert the Editorial Office when submitting (contact details are at the end of these guidelines) and include the DOI for the preprint in the designated field in the manuscript submission system. Authors should not post an updated version of their paper on the preprint server while it is being peer reviewed for possible publication in the journal. If the article is accepted for publication, the author may re-use their work according to the journal's author archiving policy. Before submitting your manuscript to the Journal of Applied Gerontology, please ensure you have read the Aims & Scope. Journal of Applied Gerontology is the official journal of the Southern Gerontological Society. It features articles that focus on research applications intended to improve the health and quality of life of older persons or to enhance our understanding of age-related issues that will eventually lead to such outcomes. We construe application to include original investigations or meta-analyses/systematic reviews that have significant clinical, policy, and/or practice implications. Rigorous studies of theoretical, conceptual, or methodological issues pertaining to research application are also welcome. Journal of Applied Gerontology is also highlighting submissions in three areas that will advance the state-of-the-art in applied gerontological /geriatric research: 1) studies that employ mixed methodologies (i.e., the integration of qualitative and quantitative data); 2) efforts that translate evidence-based research to clinical practice; and 3) policy evaluations that apply evaluation principles and methods to examine the implementation and effectiveness of a government or institutional policy or program. Because the circulation and intended audience of the Journal of Applied Gerontology is global and diverse, contributions from international scholars and across disciplines are encouraged. The manuscript text and references should be double-spaced with 1-inch margins. The body of the text must be less than 6,000 words (including abstract and references). Tables and Figures may not exceed seven (7) double-spaced pages.Tables and figures must be double-spaced, according to APA format. Additional appendices or other supplemental material may be submitted and are not included in the page limits; these materials will available online only and will not be copy-edited or typeset. Brief research reports of up to 2,500 words (including abstract and references) are also welcome. Shorter manuscript submissions are appreciated. An abstract of up to 150 words must be included with all submissions. Authors who wish to have their manuscripts considered as a highlighted mixed method, translational, or process evaluation study should indicate this in a cover letter to the Editor-in-Chief. To facilitate blind review, manuscripts and abstracts with no identifiers must be accompanied by a separate title page document with title, author(s), and affiliations(s), including complete mailing and e-mail address(es), Conflict of Interest (COI) statement, IRB protocol/human subjects approval numbers acknowledgements and funders. See sections 2.5 and 2.6 below for further details. The blinded manuscript should contain no identifiers (including but not limited to author name(s) or initials, institutions, Institutional Review Board (IRB) name or institution, protocol numbers, Conflicts of Interest (COI) statements, acknowledgments, funders, HIPAA identifiers or references to author(s)’ previously published work that would reveal authors’ identity). These required items will be added after manuscript acceptance. Manuscripts submitted will be reviewed initially by the Editor for conformance to blind review requirements. The format outlined in the Publication Manual of the American Psychological Association (6th edition) should be employed. All tables and figures should be placed at the end of the text or uploaded in a separate file. Do not include tables or figures in the body of the text. Indicate in the text where each table or figure should appear. Manuscripts accepted for publication are subject to stylistic editing with the edited draft sent to the corresponding author for final review. It is the author’s responsibility to disclose any potential conflict of interest regarding the manuscript on their title page. Authors will be required to fill out financial disclosure information and sign an exclusive licensee agreement upon acceptance of a manuscript. Any conflict or financial disclosure will be published within the manuscript. Any identifying information regarding a research participant should be removed from the manuscript or informed consent from the participant will be required. Manuscripts must identify their IRB protocol/human subjects approval numbers on the title page. Upon submission, papers are checked to ensure that they include this identifying information. Any deviation from these requirements will result in a pause in manuscript processing until corrections are made. Journal of Applied Gerontology adheres to a rigorous double-blind reviewing policy in which the identity of both the reviewer and author are always concealed from both parties. Decisions on manuscripts will be made as rapidly as possible. Authors should expect to have reviewer’s comments within approximately 6 weeks. In general, Editors will seek advice from two or more expert reviewers about the scientific content and presentation of submitted articles. JAG is committed to delivering high quality, fast peer-review for your paper, and as such has partnered with Publons. Publons is a third party service that seeks to track, verify and give credit for peer review. Reviewers for [Journal] can opt in to Publons in order to claim their reviews or have them automatically verified and added to their reviewer profile. Reviewers claiming credit for their review will be associated with the relevant journal, but the article name, reviewer’s decision and the content of their review is not published on the site. For more information visit the Publons website. All contributors who do not meet the criteria for authorship should be listed in an Acknowledgements section on the title page. Examples of those who might be acknowledged include a person who provided purely technical help, or a department chair who provided only general support. Authors should disclose whether they had any writing assistance and identify the entity that paid for this assistance. Individuals who provided writing assistance, e.g. from a specialist communications company, do not qualify as authors and so should be included in the Acknowledgements section in the accepted version of the manuscript. Authors must disclose any writing assistance – including the individual’s name, company and level of input – and identify the entity that paid for this assistance. The Journal of Applied Gerontology requires all authors to acknowledge their funding in a consistent fashion under a separate heading on the title page. Please visit the Funding Acknowledgements page on the SAGE Journal Author Gateway to confirm the format of the acknowledgment text in the event of funding, or state: This research received no specific grant from any funding agency in the public, commercial, or not-for-profit sectors. It is the policy of the Journal of Applied Gerontology to require a declaration of conflicting interests from all authors enabling a statement to be carried within the paginated pages of all published articles. Please ensure that a ‘Declaration of Conflicting Interests’ statement is included on the title page. If no conflict exists, please state that ‘The Author(s) declare(s) that there is no conflict of interest’. Submitted manuscripts should conform to the ICMJE Recommendations for the Conduct, Reporting, Editing, and Publication of Scholarly Work in Medical Journals,and all papers reporting animal and/or human studies must state that the relevant Ethics Committee or Institutional Review Board provided (or waived) approval on the title page. Please ensure that you have provided the full name and institution of the review committee, in addition to the approval number on the title page. Information on informed consent to report individual cases or case series should be included in the manuscript text. A statement is required regarding whether written informed consent for patient information and images to be published was provided by the participant(s) or a legally authorized representative in the methods section of the manuscript. The relevant EQUATOR Network reporting guidelines should be followed depending on the type of study. For example, all randomized controlled trials submitted for publication should include a completed CONSORT flow chart as a cited figure and the completed CONSORT checklist should be uploaded with your submission as a supplementary file. Systematic reviews and meta-analyses should include the completed PRISMA flow chart as a cited figure and the completed PRISMA checklist should be uploaded with your submission as a supplementary file. If submitting a manuscript reporting a qualitative study, please refer to the COREQ checklist to ensure all relevant elements are described, without compromising a blinded review. The EQUATOR wizard can help you identify the appropriate guideline. JAG conforms to the ICMJE requirement that clinical trials are registered in a WHO-approved public trials registry at or before the time of first patient enrolment as a condition of consideration for publication. The trial registry name and URL, and registration number must be included at the end of the abstract. The Journal of Applied Gerontology and SAGE take issues of copyright infringement, plagiarism or other breaches of best practice in publication very seriously. We seek to protect the rights of our authors and we always investigate claims of plagiarism or misuse of published articles. Equally, we seek to protect the reputation of the journal against malpractice. Submitted articles may be checked with duplication-checking software. Where an article, for example, is found to have plagiarized other work or included third-party copyright material without permission or with insufficient acknowledgement, or where the authorship of the article is contested, we reserve the right to take action including, but not limited to: publishing an erratum or corrigendum (correction); retracting the article; taking up the matter with the head of department or dean of the author's institution and/or relevant academic bodies or societies; or taking appropriate legal action. Before publication, SAGE requires the author as the rights holder to sign a Journal Contributor’s Publishing Agreement. SAGE’s Journal Contributor’s Publishing Agreement is an exclusive license agreement which means that the author retains copyright in the work but grants SAGE the sole and exclusive right and license to publish for the full legal term of copyright. Exceptions may exist where an assignment of copyright is required or preferred by a proprietor other than SAGE. In this case copyright in the work will be assigned from the author to the society. For more information please visit the SAGE Author Gateway. The Journal of Applied Gerontology offers optional open access publishing via the SAGE Choice program. For more information please visit the SAGE Choice website. For information on funding body compliance, and depositing your article in repositories, please visit SAGE Publishing Policies on our Journal Author Gateway. The manuscript text and references should be double-spaced with 1-inch margins. The body of the text should be less than 6,000 words (including abstract and references). The format outlined in the Publication Manual of the American Psychological Association (6th edition) should be employed. All tables and figures should be placed at the end of the text or uploaded in a separate file. Tables and Figures may not exceed seven (7) double-spaced pages. Do not include tables or figures in the body of the text. Indicate in the text where each table or figure should appear. Additional appendices or other supplemental material may be submitted and are not included in the page limits; these materials will available online only and will not be copy-edited or typeset. Figures supplied in color will appear in color online regardless of whether or not these illustrations are reproduced in color in the printed version. For specifically requested color reproduction in print, you will receive information regarding the costs from SAGE after receipt of your accepted article. Otherwise, figures will appear in black and white in the printed version. This journal is able to host additional materials online (e.g. datasets, podcasts, videos, images etc.) alongside the full-text of the article. Supplemental material refers to files that were used to create the research (such as datasets) or additional pieces to the article that could not be included in the print version (such as audio / video material that is impossible to produce in print form). There may be instances, such as certain podcasts and videos, where they are not directly attributable to a specific piece of research. Any material to be shared with reviewers must be blinded for the review process. For more information please refer to our guidelines on submitting supplementary files. All supplemental material will be freely available online to all users, regardless of whether the user has access to the article the material relates to or not. From the article page, users will see a Supplemental material tab which when clicked, displays the Supplemental Material. Files will display in a downloadable list and will also display in a widget powered by Figshare, from which users can scroll through each individual supplemental material file, and download, share a link to, or cite the supplemental material. SAGE partners with Figshare, the industry leading open repository of research data. This partnership means that any supplemental material submitted to JAG, with the exception of videos and podcasts, will be deposited to Figshare and be discoverable there, while also then being displayed next to the article. The Journal of Applied Gerontology adheres to the APA reference style. View the APA guidelines to ensure your manuscript conforms to this reference style. The Journal of Applied Gerontology is hosted on SAGE Track, a web based online submission and peer review system powered by ScholarOne™ Manuscripts. Visit http://mc.manuscriptcentral.com/jag to login and submit your article online. IMPORTANT: Please check whether you already have an account in the system before trying to create a new one. If you have reviewed or authored for the journal in the past, you likely already have had an account. For further guidance on submitting your manuscript online please visit ScholarOne Online Help. Any correspondence, queries or additional requests for information on the manuscript submission process should be sent to the Journal of Applied Gerontology editorial office as follows: jag@uchc.edu.